1: it is entirely compatible with on premise workloads that run on VMware. Yes, Amazon etc will import workloads that are currently .vmdk but transferring from VMware on premise to VMware cloud (or partner cloud #cloudsoftcat) will take with it many attributes such as security and networking configurations. 2: Corporate workloads are certified to run on VMware in a way that they aren’t with Amazon. The big example here is that VMware have an agreement with SAP – SAP is fully supported on VMware on or off prem. In fact SAP HANA (big data stuff) on vCHS is the only way to consume HANA as a service/ online for production. VMware are well aware that as servers get bigger, customers will need fewer of them so to keep revenues going in the right direction they have to be able to sell more than just vSphere, hence their three focus areas: Hybrid Cloud, Software Defined Datacentre and End User Computing. I hope that was interesting – please feel free to share your thoughts in the comments! I normally post stuff here to make sure I like it before cross-posting on the Softcat website. This one made it onto the main site before I got round to sticking it on here, but for completeness’ sake here are my predictions for 2013 – interested in your views so please feel free to comment! Evaluate your options, when the time is right – with the help of someone who can advise on a range of different approaches. On/off premise and indeed hybrid are all options. When acquiring new software, look at SaaS options alongside on premise deployments. Don’t forget connectivity – quite often overlooked when considering cloud approaches. It’s going to be a huge year for Microsoft, with new releases of Windows, Office, Exchange and SharePoint either out or shipping this year. The desktop is the obvious place to start – with the impending end of support for Windows XP (April 2014) it doesn’t take a genius to suggest that we’ll see an acceleration of Windows 7/8 migrations. It will be really interesting to see the split between Windows 7 and Windows 8. My gut feel is that Windows 7 will be the default choice but the UI in Windows 8 as well as the wide selection of form factors (pick one to suit your working style!) will drive adoption for more mobile workers. Outside of Windows, there’s a lot of interest in LYNC – and with the increase in collaboration features as well as a much more social approach SharePoint 2013 could be a hit! Familiarise yourself with the roadmap and work out where the technology matches the needs of your organisation over the coming year or so. It’s also worth taking stock of your licensing situation to make sure you’re in a position to take advantage of the new releases if appropriate. If you have Software Assurance in place, make sure you are taking advantage of some of the extra benefits – in particular Deployment Planning Services and Training Vouchers to help you get set for the roll-out. No surprises here but the pressure on IT to allow user-owned devices to connect will get even stronger. You can try and offset this with an appropriate form factor of Windows 8 tablet, but in reality your users will want to work on whatever device they choose/chose! Fortunately this year will see a range of technologies to help you secure these devices and deliver services to them. Our security team are talking about ‘The Return of the NAC’ – using network security to identify users and devices and route them securely to appropriate resources. This sort of ‘contextual analysis’ will also hopefully enable us to detect threats and infections earlier and respond appropriately. Now that this new mobile world means that we cannot rely upon perimeter-based security, maybe now we will start to see a ‘secure by design’ approach rather than making use of point products to plug gaps. We’ll also see offerings, from Citrix and VMware among others, that will provide a ‘gateway application’ delivering access to a range of internal resources, SaaS services and native apps. I’m going to go out on a limb here having spent the last year researching options – but maybe this year we will get clear and concise guidance from HMRC on tax treatment for individuals buying devices for work use, and for organisations providing a contribution towards such devices…. Fingers crossed, anyway! Now more than ever it is imperative to have a clearly defined mobile strategy. Email is the starting point – but it is definitely worth looking at how access to applications on the go can speed up the flow of your business. No doubt we will hear (as we have every year since 2006!) that 2013 will be the year of the virtual desktop… Other than that, hopefully we will see a decline in the tendency of vendors to ‘cloud-wash’ their software. Now that the whole IT world knows what cloud is, that ceases to have much value. No doubt the ‘Big Data’ bandwagon will continue to trundle on this year. I rather think the value is in the analytics rather than the size of the data! The big one for 2013 will of course be ‘Software Defined’ – the concept that functionality previously in hardware can be managed from a software layer in an abstracted manner. This has been applied so far to networking, storage and indeed the whole data centre – expect to be flooded with ‘software defined’ products by the end of the year! I’m sure, if you are reading this post, you have heard the happy news about a new baby on the way. No, not Will and Kate’s impending prince or princess – rather HP’s announcement of two new versions of their 3PAR StoreServ array aimed at the mid market, and priced from €20k for the dual controller version and €30k for the quad controller. We were absolutely delighted to be part of the launch, over in Frankfurt just before HP’s annual Discover tech show. I joined in a customer panel at the official unveiling for the press the day before Discover started. I talked about our experiences in using 3PAR as the storage platform four our CloudSoftcat infrastructure as a service platform, which has rapidly scaled to more than 200 customers, including all of our own IT. I also presented a breakout session entitled ‘From Zero to Cloud’ later on in the event. It’s great news that customers with serious IT needs but less serious budgets can now get access to this technology, which is in use at four of the top five largest hosting providers. Of course if you deploy 3PAR in your primary infrastructure, but don’t want to spend CAPEX on a DR site, you could replicate to our 3PAR-powered CloudSoftcat platform. The Softcat tech team have a demo unit of the new HP 3PAR StoreServ 7000 on order, so if you want to learn more, give us a shout! This is part 1 in an occasional series I have been meaning to kick off for a while, showcasing the more interesting pieces of vendor merchandise at conferences and so on. I have to say I am not sure we will better the first one! This week, I have been away at HP’s Global Partner Summit. One evening I attended a reception for the storage business. The marketing guys had gone crazy as the drinks on offer were branded! I went for a CloudAgile Whiskey Sour, but quite a few people were tucking in to 3PARtinis… At the end of the reception, they handed out a gift bag. 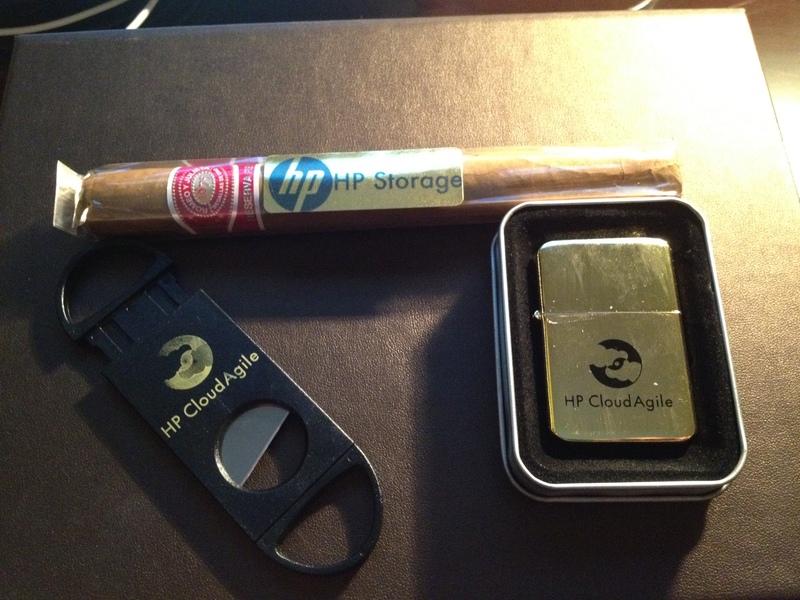 Inside, was a HP Storage branded cigar, a CloudAgile branded lighter and a cigar cutter. Amazing! Anyone seen anything cooler than that from a vendor? Not something I will make use of myself, but if any of our wonderful customers want it, drop me a line! Firstly – this approach makes a lot of sense and doing it right will help us accelerate towards device-independent, and therefore installed-OS-independent computing. I’m convinced that’s the direction in which we are eventually heading. Secondly – this is going to be an interesting market segment, as competition hots up. The big players today are really DropBox (the darling of the technical community) and Box.net (who, rumours have it, were Citrix’s original acquisition target before ShareFile). It sounds like VMware are working on their approach here, with their announcement of Project Octopus. These two giants of virtualisation and end-user computing are again on a collision course. Interesting times! Is your IT a customer satisfaction issue? I’ve been meaning to put some thoughts down about this for a while. My catalyst actually to get round to it was being asked to deliver a presentation on Softcat’s unique brand of employee and customer satisfaction at the recent Call Centre Focus conference. We were asked to present through our partners QGate, who support and develop our CRM platform. They know how seriously we take employee satisfaction and customer satisfaction, and felt we had something to share. I spoke for most of the time about the crazy place that Softcat is – how we give everybody breakfast, arrange for their ironing to be done, and generally have a great time (whilst working really hard of course) – and how because our employees feel valued, empowered and rewarded they will absolutely go the extra mile for our customers. One point I did make relates to a conversation I have been having more and more with IT guys recently. Many IT teams are concerned that lack of recent investment in infrastructure, coupled with the growth of the importance of, and demands on, IT, has led to systems that are under-performing and not delivering the user experience which their internal customers demand. I am convinced that this has a direct effect on customer service, in that customers don’t get the information or response that they need quickly enough. Equally importantly, I think this has a serious impact on employee satisfaction; if your people can’t get their systems working quickly enough to do their job, they are going to be less happy in their work. Doubtless this will affect their usual sunny disposition in dealing with customers! We’re currently making a huge investment in our own infrastructure to ensure that we can deliver to our staff and our customers the performance that they need – I’ll tell you more about the details of what we are doing in a future post. Think about your network – is it time to look at 10GbE in the server room? Consider your cloud options – you might not be ready to go full-bore into the public cloud, but pushing out some of your less critical or less security-dependent applications might free up some space for the rest – and get you used to cloud for the future. Whither now, WebOS? Up the Amazon? I’m really sad about HP shutting down WebOS hardware – I was hoping the TouchPad would be serious competition for the iPad. Looks like it hasn’t worked out that way. I guess it just took a bit long, and then maybe my hopes or expectations were too high. Lots of speculation about where WebOS will end up and whether it will be sold or licensed. I don’t know any better than the rest of you, but I reckon Amazon are a decent contender. Why? It feels to me like it could round out what Amazon have, maybe to challenge Apple in the tablet and content market. What do you think? After the event with HP’s CTO I hosted, I was fortunate to be invited to an event in London with the President and CEO of Citrix, Mark Templeton. I was quite impressed with the guy, if I am honest – a really down to earth chap, which you don’t expect at the higher echelons of a large organisation. After the main event, which was a presentation and a Q and A, he was more than happy to have a chat over a cup of coffee, which was enlightening. Some of the stuff he talked about resonated with me, as it was similar to the way we try to shape our own business. He was saying that while they are a public company and have a duty to their shareholders, they are more interested in building something interesting and powerful, which will deliver benefits to their customers – whilst having fun – than focusing short term on the needs of those shareholders. We try to do the same – focus on employee satisfaction and customer satisfaction, in our belief that the former drives the latter. If we treat our customers right, the rest will follow – I’m sure that’s an appropriate standpoint. We’re privately owned, but I’m sure Mark’s attitude will deliver for his shareholders in the long term. Anyway, back to business… Mark was talking about the way in which IT calculate the return of spending money – or how business calculates the return of spending money on IT. This is generally based on TCO – total cost of ownership – and whether having a lower TCO will generate a return for the investment over a given time period. The suggestion was that in this day and age, we should be looking at Total Value of Ownership – TVO – instead. This means concentrating more on the benefits an IT solution will deliver to the business rather than the pure costs. I guess this is particularly appropriate in the virtual desktop space where Citrix play – it’s difficult to justify a VDI project on capital grounds over the cost of replacing PCs, but the benefits come in terms of, yes, lowered operational expenditure but also in flexibility of workspace, device independent computing (letting users choose their access device), home working, employee experience… We’re likely to role out VDI for our own users, and can see such benefits, as an employer which likes to be nice to its staff, as really important. I look forward to the day when all users can access IT systems securely using the device of their choice, wherever and whenever they want. Maybe we should call it Martini computing….